It was a beautiful June Wednesday, and I'd taken the day off from work. I wanted to go lounge outside somewhere. But where? Public parks are too... public. And sidewalk cafes are too upright. I needed a pool. Washington has several hotel pools, though many of them are for guests only. 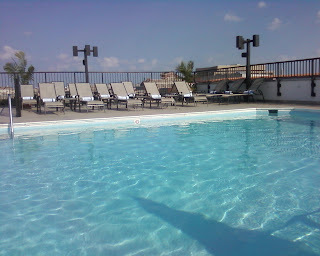 After making several calls, I decided to check out the pool at the Hilton Embassy Row, which is just north of Dupont Circle on Massachusetts Ave.
All you have to do is walk up to the front desk, ask for a day pass to the pool, pay $15 and proceed up to your own mini Shangri-La. OK, so it's not a Shangri-La. It's a postage stamp of a pool with a few serviceable lounge chairs scattered about a charmless, concrete rooftop. But it's a pool, and on this day it was nearly empty. There was one other guest sunbathing, and a lifeguard who seemed to have a lot of acquaintances fond of talking very loudly in (I think) Russian. Still, it was a great way to take a pretend vacation in the city, and the Hilton has some nice views of Dupont Circle from its rooftop. There is a covered area with tables and chairs, but no umbrellas for the lounge chairs and few shady areas, so be prepared to soak up a lot of sun. Signs warned that it was not permissible to bring food or drink in from outside, and that it had to be ordered from the hotel staff, but there was no discernible bar or food service and no one cared when I broke out a bag of snacks. The lifeguard did ask me to show my pass, so sneaking in is probably not a good idea. Here's what other hotels told me about access to their pools. Stay tuned for other forays to the few of them that will let a plebe like me in. Please share if you have any favorite spots for poolside lounging. Open for happy hour from 5 p.m. to guests of the restaurant, Zentan. It doesn't sound like you can actually swim here, but I plan to check this out and post later. 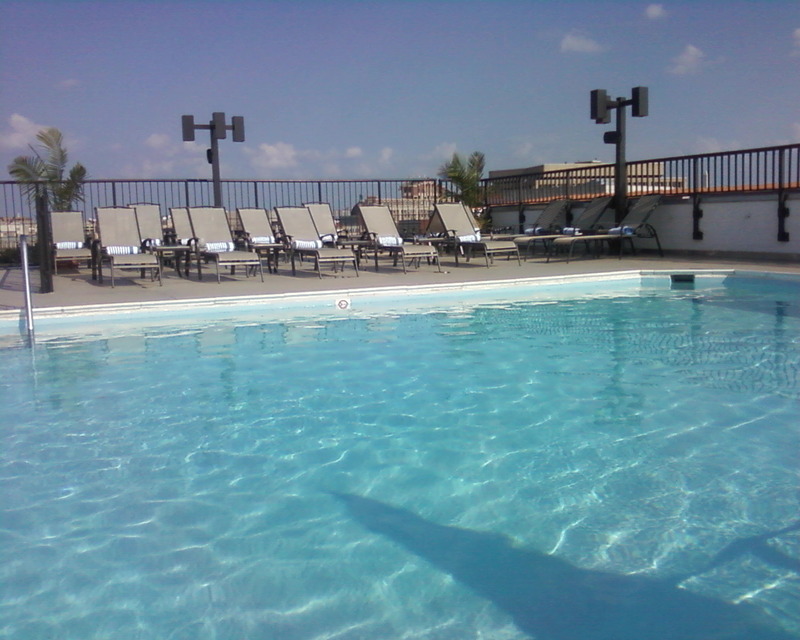 Labels: d.c. life , d.c. pools , hotel pools , pools in washington d.c.
the pool on the roof of the luxury apt. building on the northeast corner of 15th and Mass. is amazing. don't know how to get in ... know somebody i guess.